Slices of tart Granny Smith apples bring out the smoky flavor of bacon in these grilled cheddar sandwiches. Check out the video for more tips and how-tos. Top 1 bread slice with 1 cheese slice, 2 bacon slices and 1/4 of the apples; cover with second each cheese and bread slice. Repeat to make 3 additional sandwiches. Spread outsides of sandwiches with aioli. Cook, in batches, in large nonstick skillet on medium heat 3 to 4 min. on each side or until cheese is melted and sandwiches are golden brown on both sides. Prepare using fresh pear or other fresh fruit slices. 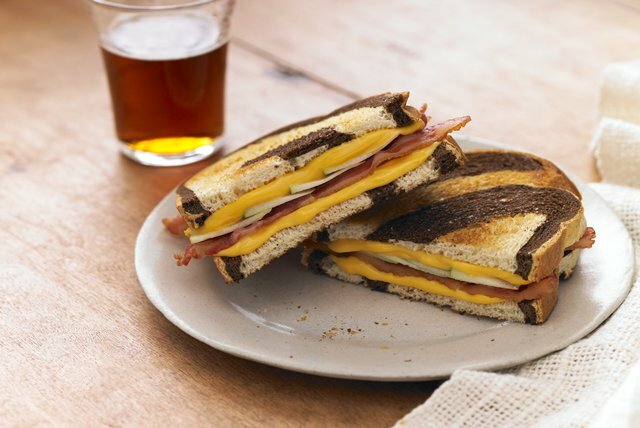 If you have a panini grill, you can instead use that to grill these cheesy sandwiches. Or, you can also use your waffle iron to cook them. Grill sandwiches 3 min. or until sandwiches are golden brown and cheese is melted.